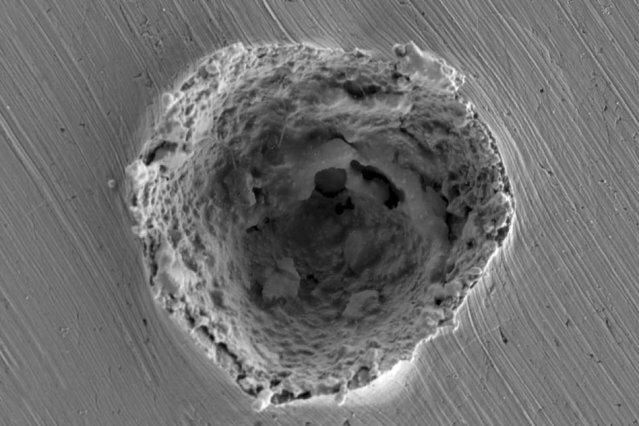 When tiny particles strike a metal surface at high speed—for example, as coatings being sprayed or as micrometeorites pummeling a space station—the moment of impact happens so fast that the details of process haven’t been clearly understood, until now. Previous studies had relied on post-mortem analysis—studying the surface after the impact has taken place. But that did not allow for an understanding of the complex dynamics of the process. It was only the high-speed imaging that revealed that melting of both the particle and the surface took place at the moment of impact, in the high-speed cases.